Building a Network marketing business will always require you to talk and build relationships with more people. It is essential to learn the listening skills that’s required to meet your prospects approval. This is mastered in time and will always be the reason one will join you. 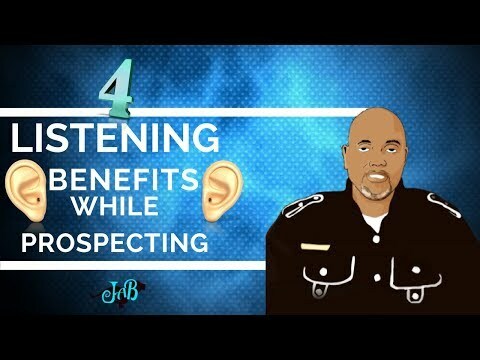 In this article and video we will discuss four of the major benefits we see are essential when listening to your prospect. The ability to listen well is a absolute necessary skill for success in all human relations. Many network marketers have been taught that in order to have success in this profession, they must be a great talker. Sincere listening leads to easier sales. Listening skills also gives results in having higher confidence that leads to a greater enjoyment from the network marketing profession. Building a business within any market will suffer without this one effect in human relationship. Here is a article and video that explains how to market any business online. Talking does not build trust; listening builds trust. There is no faster way for a person to gain the trust from another than by listening intently to what the other person has to say. 40 % of every sales process is to develop a trust bond between the prospect and the business consultant. The most fastest way to undermine trust is to irritate the prospect by talking to much and listening to little. Good listeners have a ear to be more concerned with understanding their prospects real needs and helping them to make the right decisions to solve their biggest complaints in life. When anyone has a need to make a buying decision that can ultimately change their lives, tension always occur. When there is a possibility of paying out money it always produces an alert to whether a person is making a mistake or not. The more you listen the more the prospect becomes relaxed and feels more open to considering your offer seriously. Master the listening skills just for the fact in order to lower resistance and you will make more sales. This is the holy grail of prospecting. Remember that people don’t care how much you know until they know how much you care. Rapt attention is the highest form of flattery. Listening attentively to another person can clearly show that you are genuinely interested in their outcome. Their self-esteem goes up and their feelings of personal value increases. When you actually listen to a person with warm, genuine and a caring demeanor, you connect with their personality and begin a bond of affection. The opposite of listening is ignoring. You always listen to that which you consider value and ignore that which you do not value. The fastest way to loose a prospect is to interrupt them while they are talking. This produces an emotional slap in the face and simply decreases their self-esteem. This can often cause the sales process to come to a grinding halt. It is said that you can listen and understand at the rate of 500 to 600 words per minute. The average person only speaks the rate of 125 to 150 words per minute. This means that two thirds of your listening time is available for you to think of other things. This is were discipline has to be mastered to concentrate on your prospect or your mind will drift. When you begin to master the listening skills, you will appear to the prospect as a tremendous leader with great character. You must train yourself to listen this way because this skill is especially necessary in the field of network marketing. This is so important to the process of sales because you must learn how to get out of yourself and get into the mind and feelings of your prospect. I hope these benefits has helped you to think about what skills you are going to work on to be more effective in your business. for reading this entire article and staying with me until the end, I have installed below a free gift for you to grad our ultimate guide to help you place your first Facebook ad. Click on the download now and grab your copy while it’s still free. For similar training on Emotional Intelligence skills to empower yourself and Relationships Effectively click here….